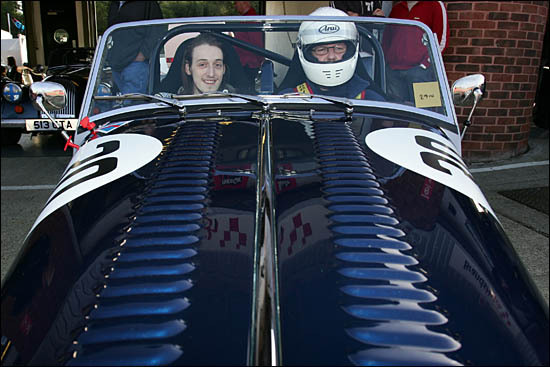 ”When I got hold of my Lightweight, I realised what a stunning car Morgan had come up with,” commented Richard Thorne at Race Car Live! - on a beautiful Sunday morning. 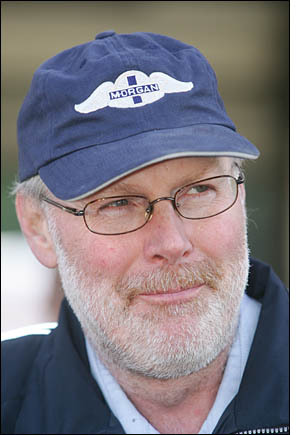 Richard Thorne is both a Morgan (and classic car) dealer, and has been involved in Morgan racing projects for a lifetime, having come to the attention of dsc with his involvement in British GTs, Bathurst, the Britcar 24 Hours and the Morgan Le Mans programme. 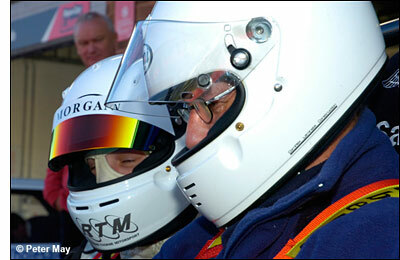 But the Morgan Lightweight Roadster is about to kick-start the Morgan Roadster Cup for 2007 – and a demonstration of the car’s capabilities, in the hands of Tom Shrimpton, suggested that Morgan has a real winner on its hands. Initially though, the very British car company won’t be making any money from these Morgans. Richard Thorne did manage to squeeze dsc’s Ed. into the car for three fast laps with the young Shrimpton – and mightily impressive it was too. My experience of the Malvern wonders dates back to a brother who was obsessed with the cars during his teens, and bought his first one in his mid-twenties. He’s now on his third new one, a gorgeous Plus 8 – but if he knew what I knew…. There are many good reasons for owning a Morgan – and one customer who became ill this year has sold his year-old Lightweight for the same price that he paid for it: £28,021 + VAT. At that price, it really is a bargain. So the Morgan Roadster Cup races will be held as part of the (two year old) Powertorque Morgan Challenge Championship, and customers will have a ten-race championship for 2007: the programme has been very carefully thought out. Including a pre-season test day, the season’s entry fee is £3,200 + VAT, while for a modest additional cost, the car can be supplied with some road car additions, such as sidescreens, windscreen, passenger seat etc. This really is a race car for the road: turn up, fit the aero screen, take off the sidescreens – and off you go. Engine, gearbox, back axle and ECU are all sealed for racing, and the tyres are Yokohamas. 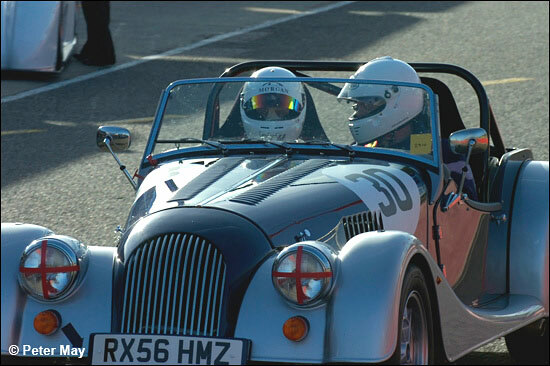 The organisers can even arrange insurance cover for each event, and a year’s road car cover, for those who choose to use their Morgan as an everyday car. Tom Shrimpton, still only 21, has a full season of British GTs behind him already, but is looking to focus on more real endurance races in the future – having already raced in the Bathurst and Britcar 24 hour events. Tom handled the Morgan as expertly as you would expect, and seemed totally un-phased by a Metro of some sort moving over on us as we approached Druids. The Morgan is every bit as good as Richard Thorne indicated: it’s smooth, taut, powerful and controllable – and nothing like my brother’s first 1600cc example (although visually almost identical) all those years ago (he doesn’t let me drive the Plus 8, the sod). There are a good number of modifications to the standard V6 road car, but as explained above, the cost of the race car is exactly the same – despite all the cost and effort of making the changes: the “buggeration factor”, as Richard Thorne describes such developments. In other Morgan / Thorne news, the original British GT Cup Class Aero 8, taken to race wins by Neil Cunningham in 2003, has been sold to Howard Spooner, who will share the car in a Britcar campaign in 2007 with Max Wakefield, the car still being run by Richard Thorne Motorsport. The team also has a second Aero 8, a converted road car (but still road legal, the car was driven to Brands Hatch by Richard Thorne's daughter Helen) which they are also keen to see campaigned on the EERC bill, perhaps on a pay per race basis. 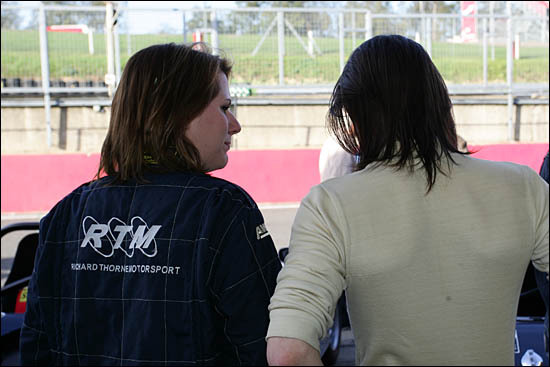 Here are Helen Thorne and Tom Shrimpton – with Helen probably advising Tom that his hair really shouldn’t be any longer then her feminine locks.... perhaps. 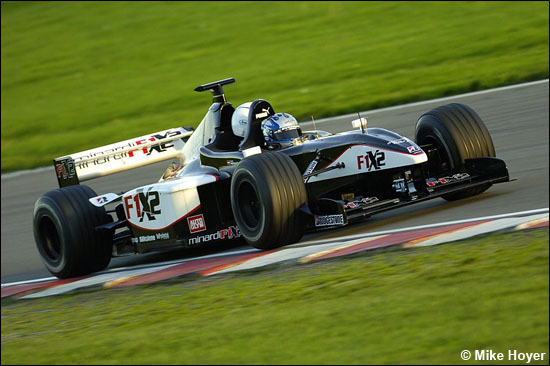 Some 'lucky' people had a ride round Brands Hatch in this Minardi two-seater (below) - but this old man just loved his jaunt in the Morgan Lightweight Roadster. And I definitely had a better view!